Living her personal philosophy of improving the human condition through her work, is award winning film and television producer and writer, Dorothea Petrie. 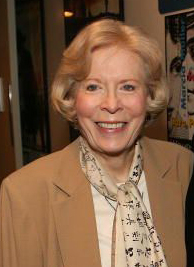 Since 1979, Mrs. Petrie has produced outstanding dramatic specials and motion pictures for television. She has received Emmy Awards, the George Foster Peabody Award, the AmadeUNESCO Award, the Humanitas Award, and many other prestigious awards recognizing her producing talents, as well as her writing abilities. Her films, which have been praised for their integrity, conscience and humanness, are a personal reflection of Dorothea Petrie's concern for the unique worth of the individual. All her films celebrate life and the victory of perseverance over adversity, even tragedy. For Orphan Train, Dorothea Petrie received the "Best Original Story Written for Television" Award in 1979 from the Writers Guild and acknowledgment from Southern California Motion Picture Council along with the Christopher Award. Mrs. Petrie's book of the same name was published and selected for the Reader's Digest Book Club. This one film and book would have been enough to prove her dedication to the greatness of people, but Dorothea Petrie went on to positively touch the lives of millions more. Her films, Angel Dusted, License to Kill, Picking Up The Pieces, Love is Never Silent and Foxfire have earned her more than recognition and awards, they have endeared her to the world. Many of Mrs. Petrie's films are produced for Hallmark Hall of Fame Television Specials. Her new film, Caroline, starring Dorothy McGuire and Patricia Neal, who are both at the 1990 Living Legacy Awards presentation, reaches out again to caress our hearts with love, kindness and understanding. Mrs. Petrie is the wife of distinguished director, Daniel Petrie, and the proud mother of writer-producer, Dan; director, Donald; actress, Mary; and film executive, June. Dorothea Petrie is leaving her legacy of integrity in many, many ways. Women's International Center is extremely grateful to acknowledge Dorothea Petrie with a Living Legacy Award for her monumental contributions to people throughout the world.